Although it sounds like it should be used in Chinese cooking, Kra chai is loved by Thai people and features in many dishes. 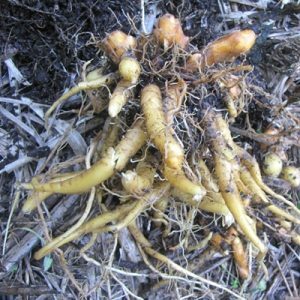 The long clusters of finger like roots are richly aromatic, giving the dishes cooked with it a lemony spicy flavour quite unlike anything else you’ve tasted. It adds wonderful depth of flavour to soups, curries and fish dishes, but a little goes a long way due to its intensely delicious flavour. It also has medicinal qualities, with the roots being used as treatment for colic and diarrhoea. We scrub it clean and store it frozen in small ziplock bags in the freezer where it keeps well for 12 months. You can sometimes find it in Asian shops pickled in brine. It tends to be very expensive to buy pickled, so having your own is a real bonus. This attractive little plant is from the ginger family. 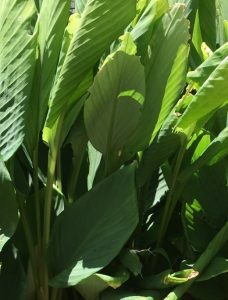 Its lush tropical leaves grow to about 60-70cm tall. It’s happy in semi shade with moist soft soil where it grows through the summer and only begins to die down in winter as the cold weather sets in. This is when you can dig it up and harvest the roots, replanting the nodes above the roots for next seasons harvest. Kra chai will also grow in pots. I plant one or two plant nodes into pots about 30-50cm diameter. 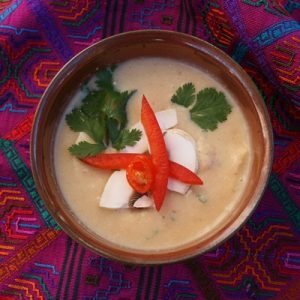 Take a look at the recipes tab for a delicious recipe for Thai coconut soup which uses Kra chai/Chinese keys.